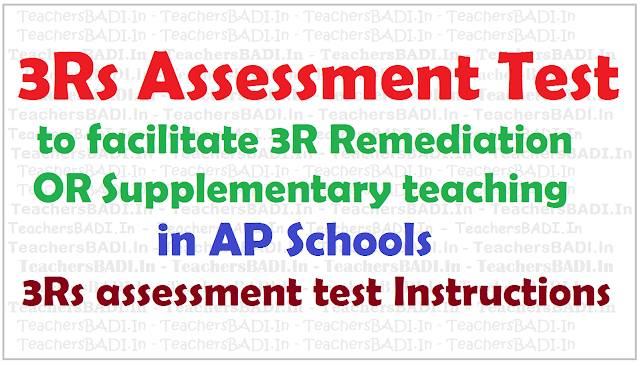 SLAS/State level 3Rs Assessment Survey in AP Primary Schools Orientation Programme: 3Rs Assessment Survey Module, Hand book. 3Rs Assessment Survey in AP Primary Schools Orientation Programme, State Level 3rs assessment survey on Reading, Writing, Arithmetic. State level assessment survey in Telugu, English, Mathematics, 3Rs Assessment Test to facilitate 3R remediation/supplementary teaching in AP Schools, 3Rs Assessment Test Instructions. 3Rs Assessment is to assess the learning levels of primary school students and to facilitate 3R remediation/supplementary teaching for those identified for low performance. SCERT Director, AP, RC.No. 06,Dated: 30.11.2016, Sub: Elementary Education - PEMANDU lab initiatives - Conduct of 3Rs assessment survey in Primary Schools in A.P - One day orientation to the District Officers and Master trainers on conduct of 3Rs assessment -Orders issued - Reg. The attention of all the District Educational Officers in Andhra Pradesh is invited to the subject read above. With respect to the PEMANDU lab initiatives read in reference 1, Govt. of A.P vide Govt Memo read in reference 2, Progs. of the Commissioner of School Education, A.P read in reference 3, it is decided to conduct 3Rs assessment test in place of slip test of Formative Assessment (F.A) – 3, on two consecutive days i.e on 14.12.2016 and 15.12.2016 for students of classes 2 – 5 in all Primary and Upper Primary schools. It is planned to conduct 3Rs assessment both in Govt. and Pvt. Schools on census base. Along with this, 80 schools (40 Govt. and 40 Pvt.) from each district will be tested through third party assessment for sampling purpose. The list of sampling schools is annexed to this progs. Except sampling schools in all other schools, the test has to be conducted by the School teachers only. Connected to this, an orientation programme is scheduled to conduct on 05.12.2016 at Vijayawada. (The venue of the orientation programme will be informed shortly) to all the District Educational Officers, Project Officers, SSA, Principals DIETs, AMOs, SSA, DCEB secretaries and 6 Master trainers from each district. The Master trainers should be good Resource Persons (SGT/S.As) who can train D.Ed students in turn, at their allotted centres in the district. The Master trainers should preferably be from the three training locations for quick access to the training centres. It is further informed that, 300 D.Ed students studying in DIETs and Pvt. D.Ed colleges need to be trained on the conduct of the above said tests in sample schools annexed. As the sample schools are spread across the district equally, the Principals of DIET colleges are requested to identify 3 different training locations and 100 students from these locations from both DIETs and Pvt. D.Ed colleges, taking the density of sample schools into account. It is therefore requested to respond quickly on the activities reiterated below.